The mystery of Star Wars: The Last Jedi is starting to unravel bit by bit. Disney and Lucasfilm are still remaining pretty tight-lipped about the highly-anticipated sequel, but they did recently allow some of the movie's secrets out of the bag. Entertainment Weekly has been revealing quite a few new images and details about Star Wars: The Last Jedi as part of their massive cover story. 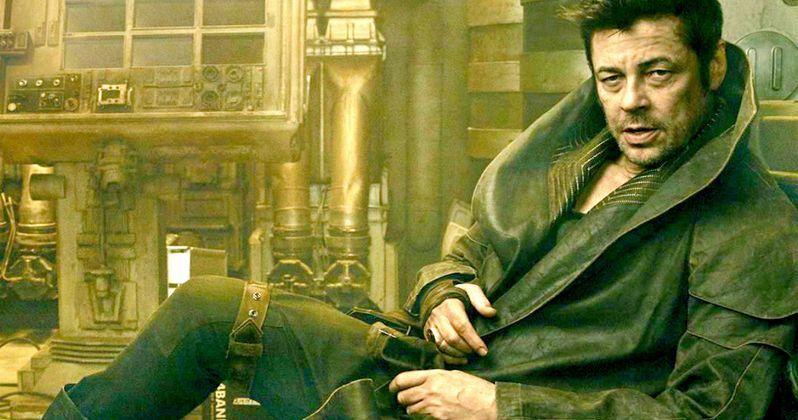 Included in that story are some new details on Benicio Del Toro's mysterious character. Entertainment Weekly showcased a new image of the main casino on the planet Canto Bight, where Del Toro's character resides. As of right now, his character is known simply as "DJ," but that isn't actually going to be his name in Star Wars: The Last Jedi and, odds are, we aren't going to find out what it is until the movie arrives on December 15. EW did, however, speak with John Boyega about how DJ fits into the story. Here's what he had to say about it. "We just need a codebreaker and he's the best in the galaxy. Unfortunately, he's very dodgy and only in it for financial gain. He doesn't fight for any side. He has distinct opinions... The Resistance bombs the First Order one day, the First Order bombs the Resistance on another. It's an ongoing war that will never end. For him, he's trying to benefit off of that, which doesn't make him the person you want to trust." We've known for a bit that John Boyega's Finn and Kelly Marie Tran's new character Rose are going to be on a mission together in Star Wars 8, and now it sounds like DJ is going to be a big part of that mission. EW elaborated a bit on his character, saying that "DJ is an enigmatic figure whose tattered, threadbare clothes and lackadaisical attitude conceal a sharp mind and expert skills." Still vague, but it sounds like the kind of thing that Benicio Del Toro could nail. According to Kelly Marie Tran, he did just that. "When I was onset with that character, I felt like there was a tiger in the room, and I always had to be watching. Like an animal, at any moment he could do something, and I didn't know what." There have been some comparisons made between DJ and Lando Calrissian, but based on what we're hearing here, it sounds like Benicio Del Toro's character is going to be much more sleazy and less charismatic. That may help to distinguish this movie a bit from Star Wars: The Empire Strikes Back a little more than Star Wars: The Force Awakens was able to with Star Wars: A New Hope. We'll know soon enough, as director Rian Johnson's Star Wars: The Last Jedi is going to arrive in theaters in just a few short (or maybe long) months.